I stared dumbly at the man, who before had seemed rather benign, but now appeared more sinister. He leaned forward and reached for my hand, shaking it and introduced himself as Signore Bugiardo. He then stood, bowed slightly and left without another word. As I watched him depart, I was baffled, somewhat irritated and more than a little concerned. It was then that I realized that he had secreted a small piece of paper into my still-opened palm. I had watched enough movies and read enough books to know better than to sit there and read the note. I may be an amateur but I am not a stupid one. I gently closed my hand over the note and continued gazing out the window, concentrating on acted interested in the view. I counted to 100 tend times before rising and carefully making my way to the ladies’ room. With practiced disinterest, I looked over the heads of the other passengers who were in various states of bored sleep. Of the man, I saw no indication. I stared at the note for a few minutes trying to fathom the implications of Bugiardo’s note, simultaneously memorizing every word, every nuance of it. After a few moments, I returned the note to its former state and pushed it into my mouth. With a grimace, then a cupped hand of water, I swallowed the note. The short melodrama of the act amused me somewhat and when I caught my reflection, I saw a wry smile playing about my lips. I quickly left the confining space and returned to my seat and resumed staring out the window. Later, as I watched the train pull away from the station, Canada bound, I picked up my suitcase and asked the ticket agent about applying my refund towards a return ticket. 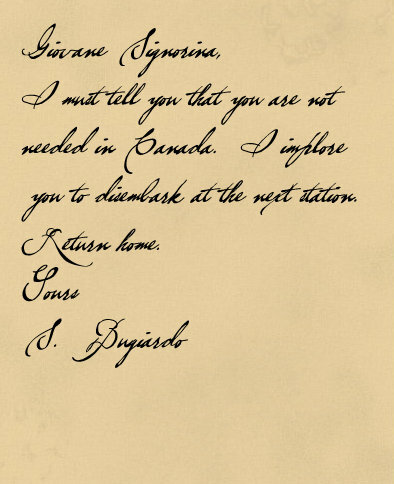 The man simply smiled and wordlessly handed me an envelope with my name written in a familiar hand. Inside was a return ticket. I looked at the ticket agent, who nodded. He turned away and I was left standing and staring at him before turning away myself to wait for my train. Years later, sitting at a café with one of my few friends, we talked about trifling matters before she lit a cigarette and after a long pull, she commented on how I had changed after that trip that I had refused to speak of. I asked her how she thought I had changed. She mulled it over for a few long moments and then spoke carefully, looking at a place just beyond my shoulder. “Bugiarda,” she replied, angrily stabbing her cigarette out. With a start, I asked her what she had said.